Communal relationships between neighbours have always been around, but nowhere more than in co-ops or strata properties. These types of living environments are becoming more and more popular but navigating them can be tricky for tenants and owners alike. Communal spaces like laundry rooms can be difficult to maintain but you don’t have to worry! Leave the tough spots to our Gorillas! A North Vancouver dryer vent cleaning makes a major difference to the health of both tenants and appliances. Cleaning out lint traps might seem like an inconvenience but it is nowhere near the effort that it takes to properly clean out a ventilation system. Lint traps are responsible for catching larger pieces of lint, paper and debris and but they can’t stop everything. Instead of just collecting near the base of the vent, lighter materials blow into the depths of the system itself, collecting against sides. These layers of debris quickly become fire hazards and pose minor health hazards to tenants and those using the communal laundry facility. Blocked air passages also restrict how functional your appliances can be. Having clothing come out of machines being damp is more than a little frustrating but even worse is the toll on the dryer itself. Poor results mean multiple loads and in an already frequently used arena, that creates a lot of unnecessary wear and tear. Don’t let clogged vents take a toll on your allergies or your appliances when a North Vancouver dryer vent cleaning is only a phone call away. When it comes to the more delicate areas of your property, professional service is the only way to go for your maintenance needs. Poking your head into a clogged dryer vent might expose more dangers than you had initially anticipated. Going into any maintenance situation blindly can mean exposure to mould, allergens and even toxic material such as carbon monoxide. 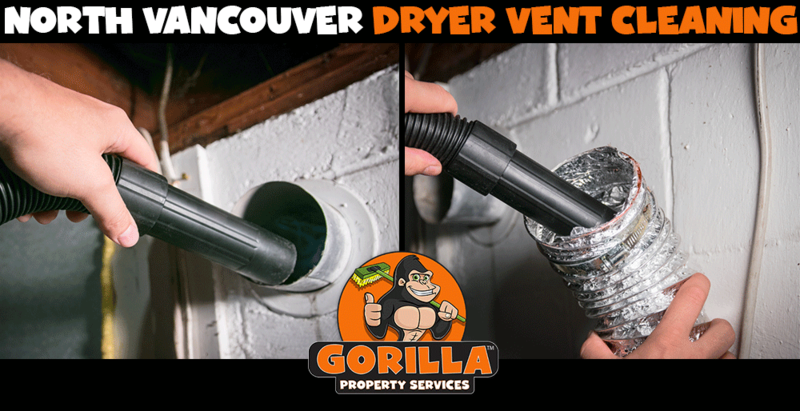 When you call in a Gorilla for your North Vancouver dryer vent cleaning, you are receiving a safe service with professional results.